The Archaeological Museum at Kamalapura is dedicated to the ruins of Hampi and the Vijayanagara Empire. Kamalapura is a small town in the Bellary district in Karnataka. It is situated within the ruins of the old city of Vijayanagara and just outside the ‘Royal Centre’ of the Vijayanagara Empire. The Archaeological Museum at Kamalapura is a small but significant museum that preserves the relics and artefacts related to the Vijayanagara Empire and its ruins. The museum started functioning in 1972 and is maintained by the Archaeological Survey of India. It captures the beauty of the bygone days of Hampi in a wonderful manner. The Archaeological Museum at Kamalapura was established under the initiative of the Archaeological Survey of India after they undertook the responsibility to preserve the ruins of Hampi. Some of the preservation work was already done by a section of British officers. These officers had collected several sculptures, statues, relics and artefacts from the ruins in Hampi and nearby locations and kept them at the elephant stables. After the construction of the modern building of the Archaeological Museum at Kamalapura by the Archaeological Survey of India, all the preserved items were transferred from the elephant stables to the new museum. The Archaeological Museum in Kamalapura has a rich collection of sculptures collected from various locations of the Vijayanagara ruins. Apart from the sculptures, the museum is a treasure trove of architectural pieces, artefacts, relics, coins, tools, miniature paintings, ivory items, copper plates and several other things from the glorious era of the Vijayanagara Empire. The museum is divided into four main sections or galleries to display the preserved items. The first section of the museum contains one of the two scaled models of the Hampi topography. It is the larger of the two models on display. It presents a complete topography of the region along with the monuments and temples located on it. It provides an excellent idea about the various attractions and their relative locations in Hampi. It also displays the hills and rivers in Hampi. Vinayaka (the elephant headed god). The third section of the museum contains an amazing collection of arms, coinage, tools, metal objects and other artifacts that were popular during the reign of the Vijayanagara Empire. Among the many interesting exhibits of this section are some documents that look like a book. These documents are made of brass and are bundled with a ring on display in a peculiar manner. The fourth section of the museum contains several antiquities that date back to the pre-historic and proto-historic eras. The objects displayed in this section are the oldest of all exhibits in the museum. The exhibits of this section also include hero stones (stone projections in memory of heroes who died in the battle fields), sati stones (stone projections in memory of wives who committed suicide after the death of their husbands in the battle fields), stucco figurines, parts of porcelain pottery excavated from the sites of the ruins and a huge collection of excavation photographs. Another impressive exhibit of this section is the smaller one of the two scaled models of Hampi. This smaller model is the more detailed one between the two and provides a complete view of the Royal Centre in Hampi along with several fine details. Hampi is a popular tourist destination. It is well-connected by several means of transport. 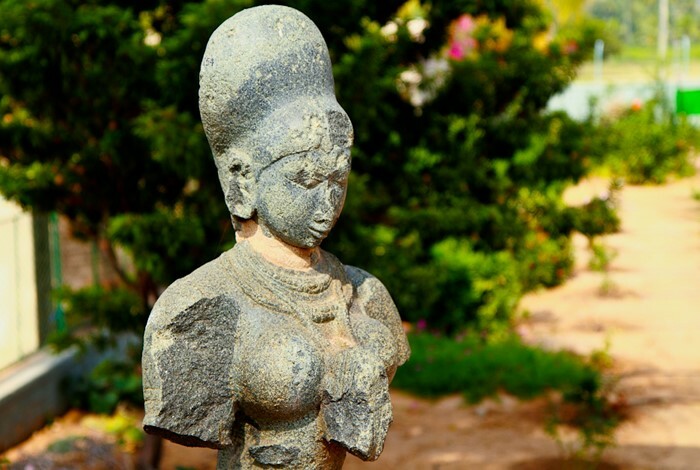 The Archaeological Museum at Kamalapura is situated in an area that can be easily reached from any part of Hampi. The nearest town to have an airport is Ballari (Bellary). Ballary stands at a distance of about 64 km from Hampi. Visitors who wish to travel by air can take a flight to Ballari and then avail local means of transport to reach Hampi. The town of Hampi has no railway station of its own. The nearest place to have a railway station is the city of Hosapete (Hospet) where the Hospet Junction Railway Station is located. Hosapete is at a distance of around 10 km from Hampi. To reach Hampi from Hosapete one can opt for a bus ride or avail other means of local transport. Hampi is a place with a well-connected road network. There are a number of buses that ply between Hampi and many of major towns and cities in Karnataka. Apart from the buses, visitors can also hire private cars, cabs or other vehicles from major cities like Bengaluru (Bangalore) or Mysuru (Mysore) to reach Hampi.